CutoverCam hauler vision system – this improves the productivity and safety of breaking out and cable extraction. Three units have been sold and a new model has been launched. 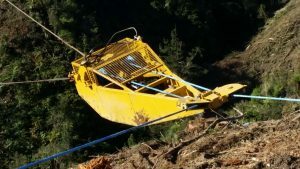 Alpine Grapple Carriage, a lightweight hydraulic grapple for cable extraction. 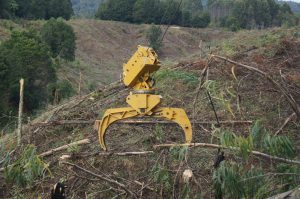 The Alpine Grapple is manufactured by Alpine Logging Ltd of South Africa, and was field tested here and modified to make it more suitable for New Zealand logging conditions. As it is non-motorised, the Alpine Grapple has a lower capital cost, is lighter in weight and cheaper to run than conventional motorised grapples. To date 13 units have been sold in NZ. Skyshifter, a remote controlled twin winch tail hold carriage for efficient skyline shifting. A prototype has been built and is undergoing field testing. 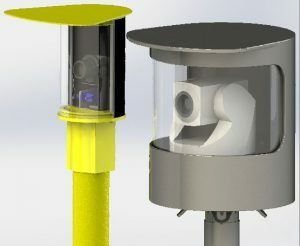 The CutoverCam hauler vision system.